Mercer Union is delighted to announce the opening of variations on a garden, a solo exhibition by Iranian-Canadian artist Abbas Akhavan (b. 1977, Tehran, Iran), at David Roberts Art Foundation, London. The sculptural installation Study for a Monument (2013-2015) presents a series of bronze plants laid out on white cotton bed sheets. These are the forms of Iris barnumea and Campanula acutiloba, among many others, native species from the area in and around the rivers Tigris and Euphrates in present day Iraq. This area is where the legendary Hanging Gardens of Babylon are presumed to have been built; in the same area in the 1990s the salt marshes were destroyed by Saddam Hussein in his campaign against the Marsh Arabs, and subsequently ravaged by the Iraq wars. Working with ‘The Flora of Iraq’ archive at the Royal Botanic Gardens, Kew, in London and living plants from the Royal Botanic Gardens Edinburgh, Abbas has enlarged the plant species to human scale. They have been sculpted into plasticine, cast into wax, encased within plaster, melted, cast into bronze and, then, charred. They are presented as a forensic experiment or funerary monument on the gallery floor. Also on display are the video installation Ghost (2013), excerpted youtube footage of American soldiers returning home to surprise their families which repeatedly fades to white, and the photograph and after and after (2003/8).The domestic sphere has been an ongoing area of research for Akhavan, and recent works have looked at the garden, the backyard, and other domesticated landscapes. It is the garden that often operates as a symbolic territory in the division between the commons and the proprietorial, between one nation and another. Texts by Francisco-Fernando Granados and Georgina Jackson are reproduced for the exhibition. Abbas Akhavan’s variations on a garden was originally commissioned by Mercer Union, and curated by Georgina Jackson. The exhibition at DRAF is supported by the Canada Council for the Arts and Canada House Trust. Abbas Akhavan has had solo exhibitions in spaces such as The Delfina Foundation, in London; Mercer Union, a centre for contemporary art, in Toronto; and FLORA, in Bogota. He has participated in group exhibitions at KW Institute for Contemporary Art, Berlin; Beirut Art Centre, Beirut; the Guggenheim Museum in New York, and the Wellcome Collection, London. He is the recipient of Kunstpreis Berlin (2012), The Abraaj Group Art Prize (2014), the Sobey Art Award (2015), and the Fellbach Triennial Award (2016). In the coming year Akhavan has solo shows at Villa Stuck in Munich, Protocinema in Istanbul, and the Power Plant in Toronto. He is the artist-in-residence at the Alexander Calder Foundation in France from January until April 2017. 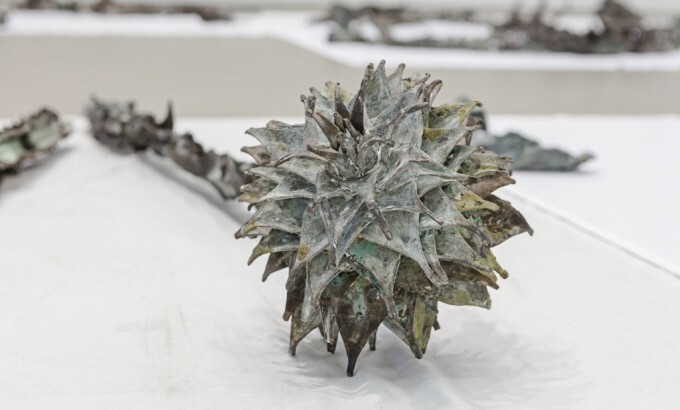 Image credit: Abbas Akhavan, Study for a Hanging Garden, 2014, cast bronze and white cotton fabric. Courtesy of the Abraaj Group Art Prize. Photo credit: Toni Hafkenscheid.